Are you treating your employees in a correct manner? Find out what happens if you don’t. 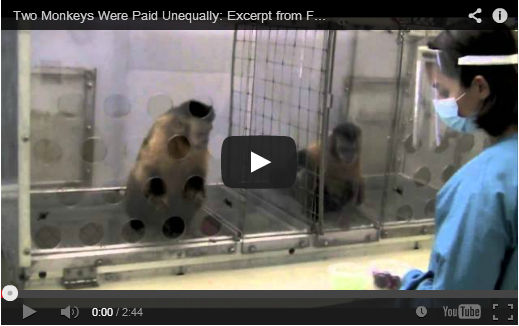 Following movie shows how monkeys react when they’re treated unequal. One monkey gets delicious fruit, the other one tasteless cucumber. Once the cucumber monkey knows the other fruit monkey is treated better, he goes … euhm … nuts. People with children probably already know that this is also valid for humans. For example, when I give our little monkey a piece of fruit and daddy takes a piece of chocolate, the fruit is flying through the kitchen when she finds out!